When two dissimilar metals come into contact in the presence of moisture, an electric current flows from the metal with the lower potential to the higher (more noble) metal resulting in corrosion of the less noble metal. The greater the difference in potential, the greater the rate of corrosion so zinc and aluminium will corrode rapidly in contact, for example, with copper. The difference in potential between copper and lead is small, so it is safe to use copper nails when fixing lead. All metals possess an inherent electro potential, briefly as shown below. Stainless steel is at the high end of the nobility scale and so can come into general contact with other metals. 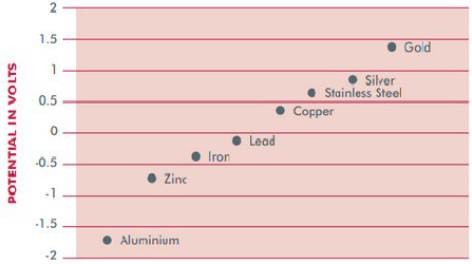 Normal potential of building metals and some noble metals compared to a hydrogen electrode. It is also unaffected by the decomposition bi-products of decaying organic materials i.e. leaf matter, vegetation, carrion. Stainless steel should not come into contact with brick cleaning fluid (hydrochloric acid) or with chlorine in concentrated form. If it does so, rinse thoroughly with water. Care must be taken to avoid débris from the angle grinding of carbon steel or similar cutting operations where swarf or iron deposits may be deposited onto the stainless steel surface. Such deposits will precipitate formation of rust and stain the stainless steel surface.